An onbuhimo is a baby carrier without a waistband. They originally came from Japan. The word “Onbuhimo” means “back carrying strap” in Japanese. “Onbu” refers to the act of carrying on the back, while “himo” means strap or rope. 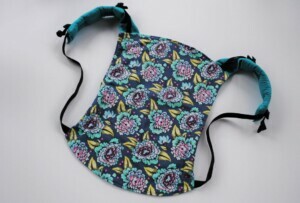 This photo is taken from SewToot The Riser a sewing pattern for making your own onbuhimo. It shows that structure of the carrrier. As you can see from this picture the shoulder straps connect directly to the bottom of the carrier. The child’s legs go through straps and the bottom of the panel is tucked up between you and your child. The straps are then tightened to support the weight of the child. The straps can be tightened using webbing and buckles, rings, or loops that are then secured with knots. We adore Onbuhimos! They are compact, so easy to carry for toddlers or older kids who walk a lot but get tired. The lack of a waistband is great for people who struggle to get waistbands to sit comfortably or who dislike pressure on their stomach. Onbuhimos are often a brilliant option for parents who are carrying during pregnancy who find waistbands above, below or around their bump to be uncomfortable. They are also a great option for parents looking to carry two babies at once. When tandem carrying, whether twins, or children of different ages, it can be difficult to get the wasitbands of two carrier to sit comfortably, and people with short torsos can find them overlapping or digging into their ribs. With one, or, if you want, two onbuhimos, then you could carry two children comfortbaly, with only one waistband, which is often much more comfortable. Having no waistband, and being open at the sides of the panel, onbuhimos are excellent for carrying in hot weather, or for parents and children who get hot in slings. 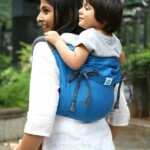 They allow plenty of airflow to both child and the adult doing the carrying. This Dad is carrying his child in a front carry using a wrap conversion buckle onbuhimo. When can I use an onbuhimo from? Onbuhimos are usually recommended from six months old onwards or from when the child has excellent head and trunk control. This is because children are usually carrier with their arms out of the top of an onbuhimo, and traditionally on the back, although it is possible to ue them for a front carry. Children are carried with their arms out of the top of the onbuhimo in order to reduce the risk of them falling out of the gap between the shoulder/leg strap. However, if the carrier is sized appropriately to the size of the child and is well tightened, so the child does not slump in the carrier, this is unlikely to occur. Arms out in an onbuhimo. Some onbuhimos are width adjustable using a drawstring to narrow the panel. Others simply rely on you gathering the panel beetween your child’s legs to ensure it doesn’t over extend them by the fabric going further down the leg than knee to knee. What types of Onbuhimo are there? Buckle Onbuhimos – usually have padded straps at the top of the carrier (although the amount of padding varies between brands,) with one half of a webbing adjuster attached to each shoulder strap and the other half attached at the bottom of the Onbuhimo. On some brands, such as Fidella, these straps can be unclipped, which allows a crossed strap carry if desired. Some brands have dual adjust webbing, allowing you to pull both up and down to tighten the slack out, for example Lenny Lamb buckle onbuhimos. Buckle Onbuhimos usually come with a chest belt clip. They also often now come with perfect fit adjusters which allow you to shorten the length of the fabric/padded straps making it easier for petite people or people doing very high back carries to be able to tighten the carrier sufficiently. Loop Onbuhimo – has fabric loops at the bottom and wrap straps at the top of the Onbuhimo. The wrap straps are threaded through the loops and secured with a knot. These are usually completely unpadded on the shoulders. Ring Onbuhimo – has rings at the bottom and wrap straps at the top of the Onbuhimo. The wrap straps are threaded through the rings to secure them. These can be padded or unpadded on the shoulders. Reverse Onbuhimos – have rings, buckles or loops at the end of the shoulder strap and wrap straps that come from the bottom of the panel and are threaded through the rings, buckles or loops at the top. Everyone has a different personal preference about style of onbuhimo, which can make trying a couple of types useful before making a decision if looking to purchase an onbuhimo. How do I wear an Onbuhimo? You can wear your child in an Onbuhimo on your front facing towards you or on your back. This video from Lenny Lamb demonstrates a back carry with an Onbuhimo. There are several methods for getting a child on your back in an onbuhimo. The most popular tend to be seated lift and superman. Below are some videos of the different methods you can use with some information about what ages and conditions the methods are best suited to. With thanks to HuggyBerry Wraps for this wonderful onbuhimo. It is very important when tightening an onbuhimo to ensure that you tighten the slack out of the straps without pulling on panel so that it shifts up your child’s back. If you try to tighten the slack out of an onbuhimo by pulling down on the shoulder straps, the panel will move up the child’s back putting pressure on the neck and causing them discomfort. Instead, ensuring the top of the panel begins in the correct place gather the slack and move it towards the buckles or rings and pull upwards from the bottom, to avoid the panel creeping higher up your child’s back. A video on how to avoid this issue when tightening is coming shortly. What features are available in an Onbuhimo? Like all carriers there is a huge range in the features and combinations of features between different brands of onbuhimos, so it can be very useful to try different versions to determine which style is the best fit for you. Onbuhimos can be made from classic cotton canvas or from more moldable but more expensive woven wrap material. The shoulder straps can differ a lot on different onbuhimos – they can be wide/narrow, padded/not padded/part padded, wrap strap style/cotton and more. If you would like to try an onbuhimo to see if they are right for you, or if you would like to hire one for a holiday, or whilst pregnant, then take a look at our Onbuhimos available to hire. Click on the images below to book the carrier for hire. We love onbuhimos and would love to hear what you think too. If you would like to have further advice, you can book a consultation with us! We offer both phone and video consultations, and 15 minutes on the phone is free! You can book directly here or drop us a message and we can arrange a time which suits you.